Today is Ash Wednesday - the beginning of Lent. Yesterday it was Shrove Tuesday which to lots of people means Pancake Day - traditionally it was the day that you would have a feast to use up products like sugar, fat and eggs, which were restricted during Lent. We enjoyed pancakes of lemon and sugar (the low calorie version) and bananas, syrup and single cream. Absolutely delicious. My toddler enjoyed devouring them immensely! Did you have pancakes? 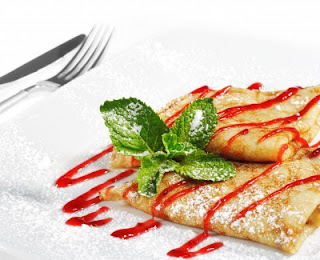 What mouthwatering fillings did you have in your pancakes ? Will you be giving anything up for Lent and what will it be ?